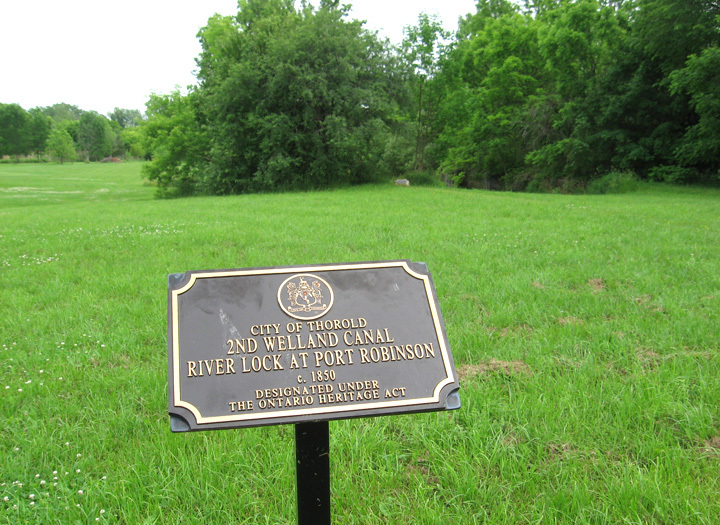 If you read up on the history of the Welland Canals, you'll eventually hear about a place called "The Deep Cut". 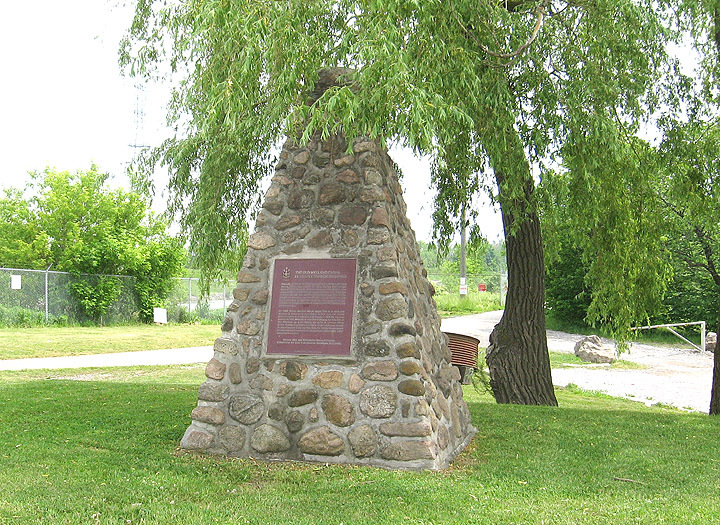 The name refers to a 60 foot hill that the Welland Canal needed to cross to reach the Welland River. Although a tunnel was first attempted, a deep channel was dug instead. The name "Deep Cut has been associated with the place ever since. It looks insignificant today, but in the 1800's the Deep Cut was the biggest challenge faced by the canal. So much so that William Hamilton Merritt chose this place for the canal's official ground breaking ceremony on November 30, 1824. Digging started immediately and when problems digging the channel occured in 1828 they led to the creation of the Feeder Canal as well as locks in Allanburg and Port Robinson. Before seeing the deep cut, it helps to know a bit about the channel, Allanburg and Port Robinson. The Channel:is pretty simple to explain. Canal builders needed to dig a deep channel through a ridge about two miles long from where Allanburg is today south toward Port Robinson. The depth of the channel of course was also a big concern. The deeper the channel - the more digging that needed to be done. 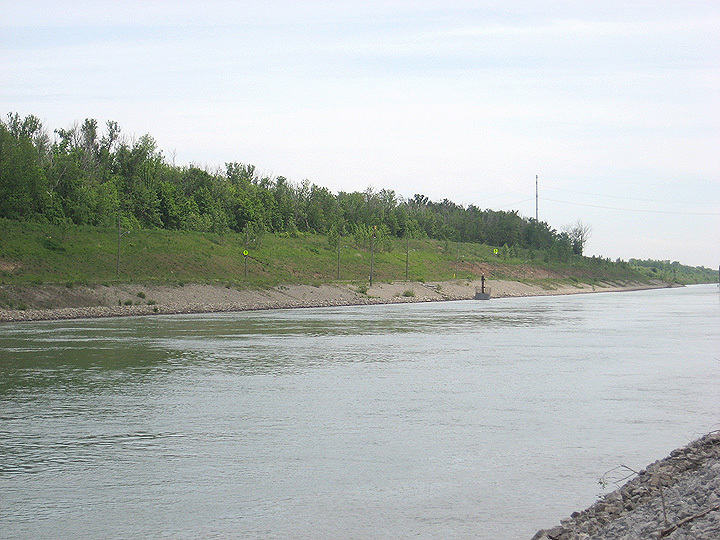 The original plan was to dig the channel to the same height as the Welland River (561 feet above sea level). When a landslide occured at the Deep cut it was decided to get water from a higher eevation. The height of water in Lake Erie was 571. After Damming the Grand River before it flowed into Lake erie. Water at an elevation of 577 feet was found. The following map shows a great comparison of the Ridge the canal needed to pass through as well as the elevations of several sources of water. Allanburg:When the canal was first designed, Allanburg was never intended to exist. 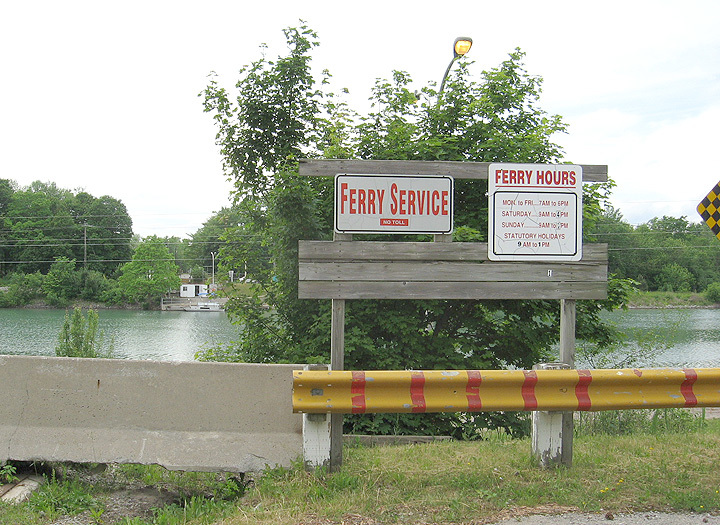 it was simply here that the welland canal channel started through the deep cut. 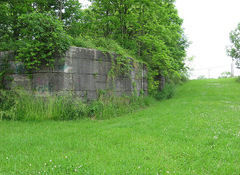 When a decision was made to not make the deep cut less deep, two locks needed to be built in Allanburg. The locks of course, required people to work the locks and the drop in water level at Allanburg could provide power for mills and other induriest. Allanburg quickly developed as a small town along the canal. It's mostly cleaned up now, but here's a quick guild to what once was in Allanburg. All maps have the same scale and land area. To see the Deep Cut you have two options, You can drive to Allanburg and Port Robinson and look around or you can hike between the two towns. The photo tour assumes a hike and recommends the east bank. Old Welland Canal Monument: I'd recommend starting in Allanburg. There's a small parking lot just west of the Allanburg bridge with a monument marking the spot where William Merritt held the first canal's ground breaking ceremony. The monument is also a great place to orient yourself. Facing the front of the monument, you're looking south toward the ridge. Originally conceived of in 1818, by it's promoter William Hamilton Merritt, to divert trade from the Erie Canal and New York and built under private auspices, the canal was opened in 1829. After additional work in 1833 the canal with its 40 wooden locks linked Port Colborne on Lake Eire with Port Dalhousie on Lake Ontario and brought prosperity to its environs by permitting the export of upper Canadian staples through New York. 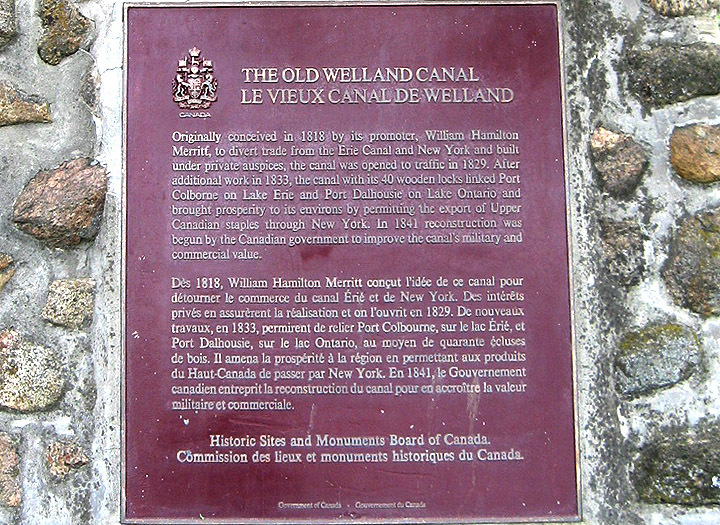 In 1841 reconstruction was begun by the Canadian government to improve the canal's military and commercial value. 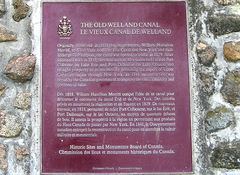 First Welland Canal: Just southwest of the monument there's a stream with water rushing into it. 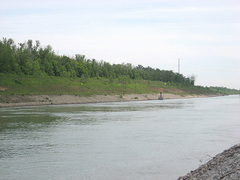 The channel was originally part of the First Welland Canal. Later when plans changed and locks were built in Allanburg the canals route was changed. Leaving this channel untouched. Today the channels used to bring drinking water to St. Catharines. The Deep Cut: Before leaving this area, head south about 100 yards along the canal. The Welland Canal Parkway trail passes through here so it should be easy going. After a short distance you can see the highest banks of the canal. It's difficult to appreciate their height, but the banks still climb 60 above the canal and extend for at least 30 feet for 2 miles. Allanburg: If you head back to the Allanburg bridge you can cross over to the east bank and see the town of Allanburg. Today Allanburg is a quiet rural community and looks like it would be a nice place to live. It surprising, but considering all the industry and waterways that once stood here, only the street names remain. View from the top: I didn't expect this but climbing the ridge and being 60 feet above the canal, gives a great view of the canal. If you look ahead you can see Port Robinson 2 miles away. Port Robinson: Entering Port Robinson along the canal brings to to a large flat part. 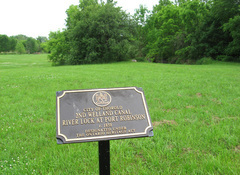 The park was once flooded and the original route to the Welland River. The one remaining lock is across the Street. Port Robinson Lock: The path accross the street is actually the route the first and second canals took to the Welland River. The ston lock they used is just across the street. When it was built it replaced two wooden ones that passed just 10 feet north of this one. The path of the canal continued in a straight line to the Welland River about 100 meters ahead. Port Robinson Ferry: Just a small addition here. If you continue south along the canal you should see a dead end road leading to the Welland Canal. The bridge was destroyed, instead of rebuilding it a free ferry service was set up. If you come when it's open you can cross over and hike back on the other side of the canal. Port Robinson Ferry: Port Robinson used to have a bridge. When it was destroyed in August 25, 1974 a decision was made to install a ferry service. If you're traveling on foot or bike, you have the option to cross over to the west bank for the return trip.